It's been a while since I baked anything.Few days back,when in-laws were here,I baked a batch of Brownies for my li'l niece and after that it was Navrathri and I didn't bake anything at all.A super short trip to my hometown, to meet friends,later,I am back home with an itch to bake like never before! Whenever I am craving for something rich and chocolaty,I turn to baking brownies.Though I never can zero down on one recipe for a brownie,off late,this one has been a keeper.I dilly dally a lot when it comes to how I want my brownie to be,sometimes I want chewy and fudgy brownies and sometimes I crave for those gooey brownies which are crusty on top and gooey in the middle. I think this one fits the bill perfectly.It forms a beautiful crust after baking and is rich and fudgy.Perfect to pair with some ice-cream. Grease and line an 8′ square baking tin.Preheat oven to 190C. 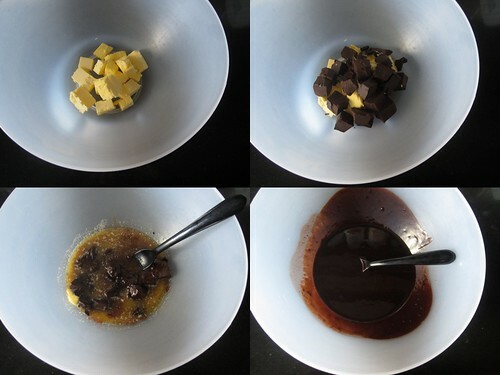 In a Micro-proof bowl add butter and chocolate and microwave on full power for 1 minute.Stir the mix till the chocolate is melted.If any chocolate chunks remain,microwave for another 30 seconds. 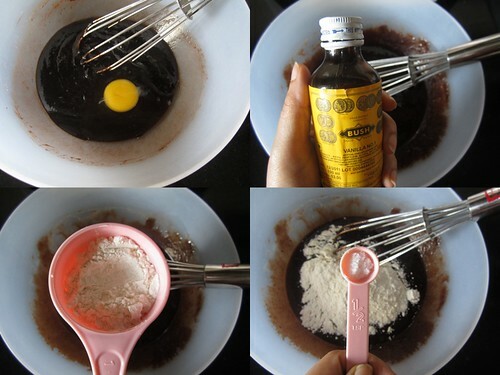 (you can do this on stove top too by double boiling the bowl of chocolate and butter). 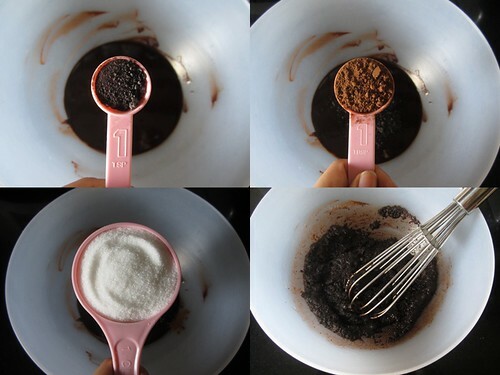 Mix in the instant coffee powder,cocoa powder and caster sugar and beat. Add in the eggs one by one,beating well after each addition.Stir in the vanilla. Add flour,salt and beat well. 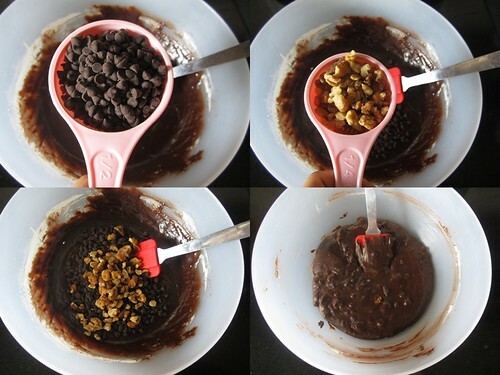 Fold in the chocolate chips and walnuts and give a final mix. Pour the batter into the prepared cake tin and bake for 30-35 minutes or till a toothpick inserted into the center comes out clean(a few moist crumbs here and there is fine as the brownie continues cooking as it cools down). 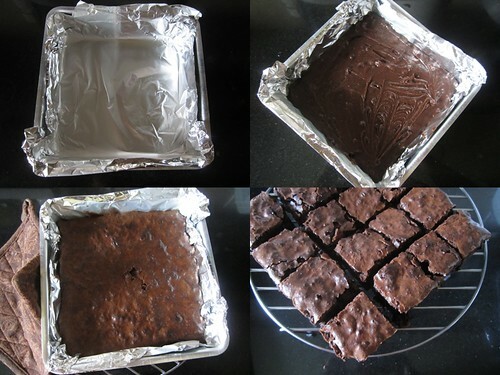 Let the brownie cool in the tin for 10 minutes and then remove from the tin and continue cooling on the wire rack. When completely cool,cut the brownie into 16 pieces,a dough scraper works best here. Serve warm with some ice-cream or with coffee. You can skip the nuts if you like,but personally I feel walnuts add an extra zing to the brownies.Cinnamon(powdered)too is a wonderful addition,add it along with the flour. Wait for the brownies to cool down completely to get neat squares.I couldn’t wait(as usual) and cut them when they were still warm. 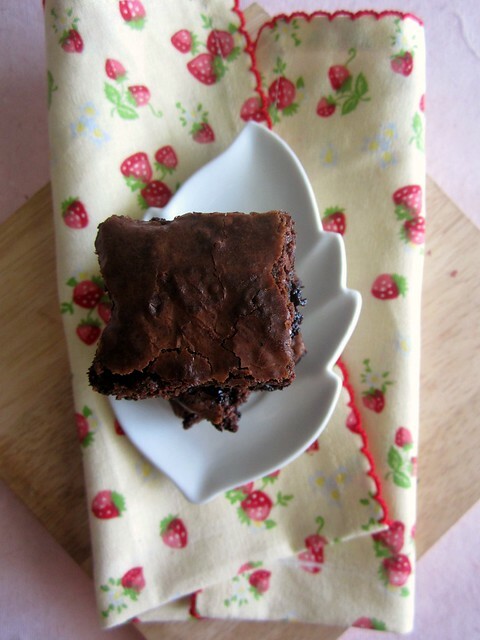 Every oven is different so baking time may differ.However when it comes to baking brownies,under baking is fine as over baking would result in hard brownies and you wouldn’t want that! Hi lovely brownies!! !i hav a Question,can i use normal sugar instead of caster sugar?if so,wat measure i shld take?i hav electric oven not microwave,can i use aluminium foil in tat?? You can use normal sugar,just pulse it for 5-10 seconds in a mixer till the granules break down a little.Brownie batter doesn't require rigorous mixing,so I use fine granule/caster sugar so that it mixes in easily.Please use the same quantity as mentioned in the recipe.You can use aluminium foil as it helps getting out the brownie from the pan easier. Wish i get some squares rite now, cant agree more a prefect pair with some scoops of vanilla icecream. looks finger licking good. love the beautiful clicks as well. really tempting. i have godrej 30L microwave with convection and grilling buttons till now i have not used this. can i use convection mode for these brownies but in which utensils till now i use microwave only for reheating. Use convection mode and bake.Please use oven-proof containers-like Pyrex or non-stick pans or regular aluminium baking tins,NOT Microwave containers. They look delicious. So perfect and tempting. these looks so yumm and love the beautiful clicks. Have you tried making these with cane sugar? or just regualr brown sugar? I am not sure how it ended up being too sweet.I used regular dark chocolate compound and caster sugar.It was just rightly sweet. Wow. 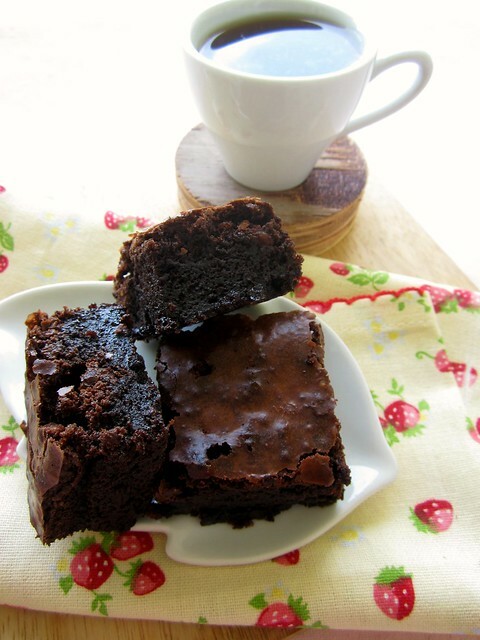 I don't usually try other brownie recipes, but this one just looks so so good. I would make it right now if I had any chocolate around! 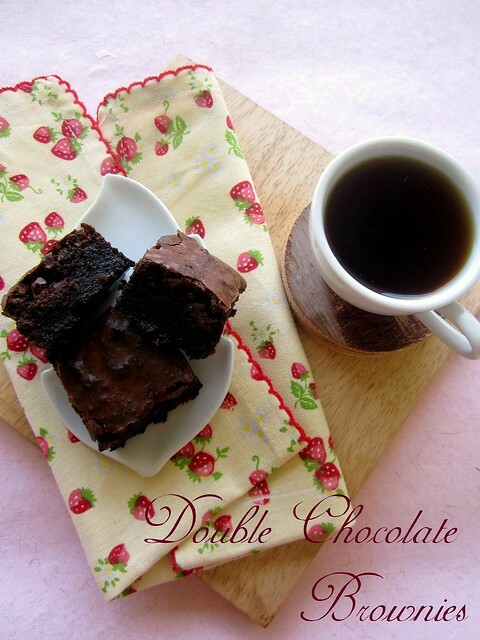 Hey.. For this recipe should baking chocolate be used or just regular dark chocolate.. TIA! I use a variety called chocolate compound for all my bakes.You can use any regular dark chocolate you have. Hi divya! Can't wait to try this. Just a small query. Can I use dairy milk or bournville instead of more chocolates? Hi divya, I have tried this at least thrice and it came out delicious. Just a small query. I want to make it eggless. So do I need to add any substitute for eggs? How to measure 3/4 cup of flour?